Q: Can I eat fast food and take-out during pregnancy? A: Take out, also called fast food, is bought at the restaurant and eaten elsewhere. These foods are most often fast foods like pizzas, hamburgers, fish and chips, sandwiches, kebabs, sausages and so on. During pregnancy you may feel strong cravings for takeout food. You may also feel too tired to cook food at home which is all the more reason for fast food, right? However, fast food should be avoided during pregnancy if possible. These food choices contain loads of salt, sugar and sometimes even chemicals that can harm both the mother and the unborn child. They are also extremely greasy, fatty and full of cholesterol which is not the healthy foods the obstetrician has prescribed for a healthy pregnancy. 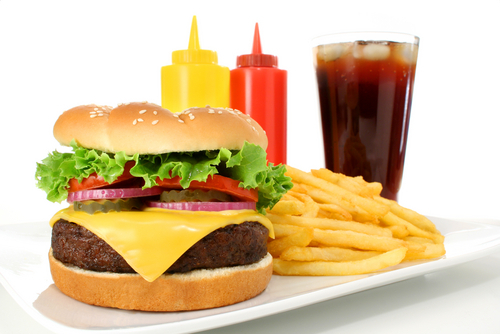 Fast foods are also linked to faster weight gain during pregnancy and obesity in the general population. Obesity during pregnancy can lead to gestational diabetes. This disease will only put you on a very strict diet and make things harder for you and baby. During pregnancy, your digestive system may not be able to deal with the 'heavy' fast foods like donuts and fried chicken. These foods do not have any nutritious value and can leave the pregnant mother was gas, bloating and indigestion. Veggies, fruits and home cooked foods on the other hand tend to be lighter and easier on the stomach, plus they are loaded with nutrients essential for your unborn baby's growth. If the craving gets too strong to resist, you might indulge in a fast food meal. Make sure you pick one of the healthier alternatives on the menu. For instance, instead of ordering a barbeque brisket order a dish of broiled chicken breast. Also don't leave your fast food in a hot car if they are chilled or frozen. Preserve them in a chill bag and transfer to the refrigerator when you get home. Considering all the risks takeout foods pose for you and your baby, it would indeed be prudent to shun them during pregnancy as much as you can. Besides protecting the health of your baby you will also save a lot of money! Read about which specific fast food to avoid in pregnancy. And, not to confuse you, but if you are pressed for time, you can read about some fast foods that are safe to eat during pregnancy.